All of my father’s recent ancestry stems from Duquesne, Pennsylvania. Once a steel manufacturing boom town, the city now exhibits only remnants of its once robust past. If a visitor ventures onto the bumpy, brick side streets of Duquesne, they will easily notice the number of old churches planted in this city. 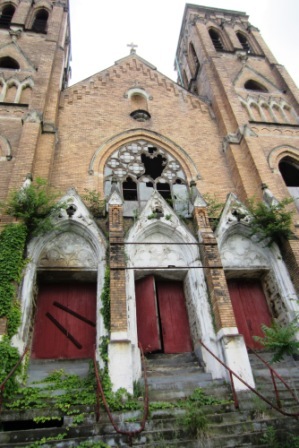 In fact, a fellow blogger (http://duquesnehunky.com) recently quoted the Duquesne Observer Supplement stating that in 1902 Duquesne had over 10,000 residents and 16 churches. But, everything is subject to change over time. Currently my dad is in the McKeesport Hospital, just across the river. He suffered a stroke three weeks ago and is still undergoing rehabilitation. My husband and I are staying with my mother to help her through this stressful time. She hobbles when she walks and complains of bad knees; just a few years ago she was walking several miles a day. Both parents officially became octogenarians on their most recent birthdays and have already outlived all of their parents thanks to societal changes for the better. Interestingly enough, I am struck by the fact that my parents seem to have a lot in common with the old church on the hill. Old age has crept upon my parents like the weeds and vines slowly enveloping the strong brick fortress of the church. Like the broken windows, their eyes no longer reflect vitality, and their perceptions have been clouded over, needing lenses from outside to help them clearly see the path before them. Their squeaky hinges have trouble functioning and need the assistance of walkers and wheelchairs and a whole lot of love to keep them in good working order. When I first noticed the church, I was awed by its strength and beautiful architecture. The broken windows and gutted interior went unnoticed as I envisioned the magnificence of the edifice as it must have looked a century ago. Similarly, I find joy when I look past the aging bodies of my parents and see them for who they once were in the prime of their lives, living life to its fullest and contributing to society in their own unique ways. The winds of change blow through our lives, sometimes as balmy breezes other times as chilling gusts. Buildings, bodies and buttercups do not last forever. Let’s remember to appreciate the buttercups in our lives before they drift away and are gone.